Hard labour for US man in N Korea Jump to media player An American man is sentenced to six years of hard labour for "hostile acts" by a North Korean court. North Korea leader hails purge Jump to media player The North Korean leader Kim Jong-un praises what he described as the "elimination of factionalist filth" in what are thought to be the first public remarks on the execution of his uncle. N Korea 'like Nazi Germany' Jump to media player The international community must act on evidence that crimes against humanity are being committed in North Korea, says a long-awaited UN report. North Korea holds live-fire drill Jump to media player North Korea has begun a live-fire drill near the disputed inter-Korean western maritime border, South Korean officials say. Koreas hold rare high-level talks Jump to media player Officials from North and South Korea are holding their first high-level talks since 2007. Jailed US man in N Korea appearance Jump to media player Kenneth Bae a US citizen held in North Korea for more than a year, gives his first news conference since his arrest and calls for US help. Obama shows support for South Korea Jump to media player On a visit to South Korea, US President Barack Obama has expressed his condolences over last week's ferry disaster and expressed support for the country in the face of North Korean hostility. 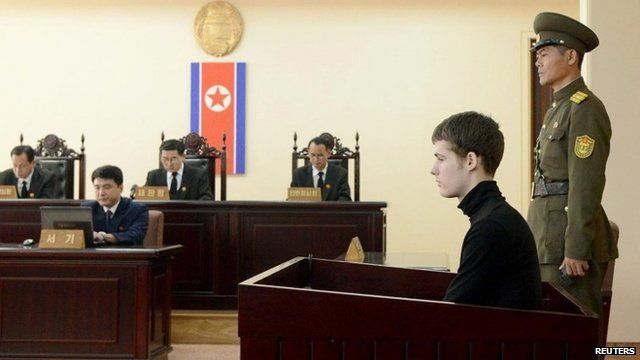 An American man has been sentenced to six years of hard labour for "hostile acts" by a North Korean court, the state-run KCNA news agency has said. Matthew Miller was arrested in April, shortly after arriving as a tourist. The charges against him have not been specified but authorities claim he tore up his visa and demanded asylum. The US accuses North Korea of using Mr Miller and two other detained Americans as pawns in a diplomatic game.